We’re all excited about Swift 3. It’s awesome, and if you’re reading this article, you shouldn’t be using it (yet). As great as it might be, it’s a huge source-incompatible change, much bigger than Swift 2 was a year ago. And if you have any Swift dependencies, they too need to upgrade to Swift 3 before your app can. The great news is that, for the first time ever, Xcode 8 comes with two versions of Swift: 2.3 and 3.0. In case you missed the announcement, Swift 2.3 is the same language as Swift 2.2 in Xcode 7, but with some minor API changes (more on those later). So! To maintain simultaneous compatibility, we’ll be using Swift 2.3. But that much is likely obvious to you. Now let me show you how to actually configure your Xcode project so that it runs on both versions. This option is new to Xcode 8, so while it will cause it to use Swift 2.3, Xcode 7 (which doesn’t actually have Swift 2.3) just ignores it completely and keeps building with Swift 2.2. 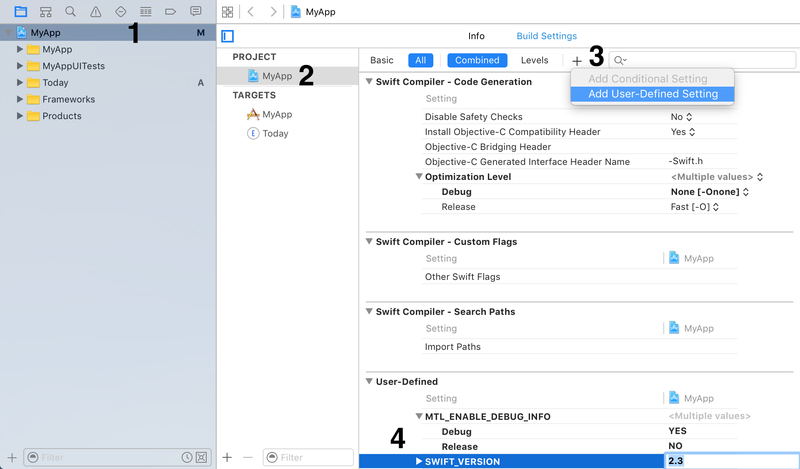 Xcode 8 makes some changes in how Framework provisioning works — they will continue to compile as-is for the simulator, but will fail to build for a device. Be sure to replace “ABCDEFGHIJ” with your Team ID (you can find it in Apple Developer Portal), and keep the forward slash at the end. This essentially tells Xcode 8 “hey, I’m from this team, you take care of codesign, okay?”. And again, Xcode 7 will just ignore it, so you’re safe. Go through all of your .xib and .storyboard files, open the right sidebar, go to the first (File inspector) tab, and find the “Opens in” setting. It will most likely say “Default (7.0)”. Change it to “Xcode 7.0”. This will ensure that even if you touch the file in Xcode 8, it will only make changes that are backwards-compatible with Xcode 7. I still suggest to be very careful about changing XIBs with Xcode 8. It will add metadata about the Xcode version (I can’t guarantee that this is stripped when you upload to App Store), and will sometimes try to revert the file to Xcode 8-only format (this is a bug). When possible, avoid touching interface files from Xcode 8, and when you have to, carefully review the diff, and only commit the lines you need. Make sure that your project and all its targets have the “Base SDK” build setting set to “Latest iOS”. (This will almost surely be true, but worth double-checking.) This way, Xcode 7 will compile for iOS 9, but you can open the same project in Xcode 8 and work on iOS 10 features. If you’re using CocoaPods, you also have to update the Pods project to have the right Swift and provisioning settings. Again, be sure to replace ABCDEFGHIJ with your Team ID. And then run pod install to regenerate the Pods project. Alright, it’s time: open the project with Xcode 8. The first time you do so, you will be bombarded with a lot of requests. Xcode will urge you to upgrade to the new Swift. Decline. Xcode will also suggest to update the project to “recommended settings”. Ignore this as well. Remember, we already set up the project so it compiles on both versions. For now, it’s best to change as little as possible to keep simultaneous compatibility. And more importantly, we don’t want the .xcodeproj to contain any metadata about Xcode 8 while we use the same file to ship to the App Store. Like I said before, Swift 2.3 is the same language as Swift 2.2. However, the iOS 10 SDK frameworks have updated their Swift annotations. I’m not talking about the Grand Renaming (that only applies to Swift 3) — still, the names, types, and optionality of many APIs are slightly different. Awesome! One file, no branching, simultaneous compatibility on two versions of Xcode. In Swift 2.3, many signatures lost their unnecessary optionality, and some (such as many properties of NSURL) now became optional. let specifier = url.resourceSpecifier ?? "" let specifier = optionalize(url.resourceSpecifier) ?? "" // works on both versions! We’re taking advantage of Optional lifting to get rid of ugly conditional compilation at call site. See, what the optionalize() function does is it turns whatever you pass in into an Optional, unless it’s already an Optional, in which case, it just returns the argument as-is. This way, regardless if the url.resourceSpecifier is optional (Xcode 8) or not (Xcode 7), the “optionalized” version is always the same. In Swift 2.3, a numer of functions (especially in the macOS SDK) have changed their argument types. Notice the type of styleMask. It used to be a loosely-typed Int (with the options imported as global constants), but in Xcode 8, it’s imported as a proper OptionSetType. Unfortunately you can’t conditionally compile two versions of the signature with the same body block. But don’t worry, conditionaly-compiled type aliases come to rescue! Now you can use NSWindowStyleMask in the signature, as you would with Swift 2.3. And on Swift 2.2, where the type doesn’t exist, NSWindowStyleMask is just an alias for Int, so the type checker stays happy. Swift 2.3 changed some previously informal protocols to formal protocols. For example, to be a CALayer delegate, you just had to descend from NSObject, no need to declare conformance to CALayerDelegate. Indeed, the protocol didn’t even exist in Xcode 7. But it does now. By this point, your project should be able to compile on both Xcode 7 and Xcode 8 without any branching necessary. Awesome! Just using @available(iOS 10, *) and if #available(iOS 10, *) is not enough. First of all, it’s safer not to compile any iOS 10 code in your shipping app. But more crucially, while the compiler requires these checks to ensure safe API usage, it still needs to be aware that an API exists. If you mention any method or type that doesn’t exist in iOS 9 SDK, the code won’t compile on Xcode 7. Therefore, you need to wrap all of your iOS 10-specific code in #if swift(>=2.3) (You can safely assume Swift 2.3 and iOS 10 are equivalent for now). Often times, you’ll need both conditional compilation (so that you don’t compile unavailable code on Xcode 7) and @available/#available (to pass safety checks on Xcode 8). But the thing is, if you’re working on iOS 10, you probably want to make one of those new extensions for your app, not merely add more code to the app itself. That’s tricky. We can conditionally compile our code, but there’s no such thing as a “conditional target”. So here’s the idea: keep the target and its code everywhere, but conditionally remove it from the “Target Dependencies” and “Embed App Extensions” build phases of the app target. How to do this? The best approach I came up with is to have the app extension disabled from build by default for Xcode 7 compatibility. And only while you’re working with Xcode 8, re-add the extensions temporarily, but never actually commit the change. If doing this manually sounds fickle (not to mention incompatible with CI and automated builds), don’t worry, I made a script for you! One final note about iOS 10 app extensions: Xcode templates for those will generate Swift 3, not Swift 2.3 code. This won’t actually work, so make sure to set the app extension’s “Use Legacy Swift Language Version” build setting to “Yes”, and rewrite the code to Swift 2.3. Once September hits and iOS 10 is out, it’s time to drop Xcode 7 support and clean up your project! Make sure all of the Swift libraries you depend on have updated to Swift 3. If not, consider contributing the Swift 3 port yourself. When all of the above is ready, you can upgrade your app to Swift 3! Go to Edit → Convert → To Current Swift Syntax…, select all of your targets (remember, you need to convert everything at once), review the diff, test, and commit! If you haven’t done so already, consider removing support for iOS 8 — this way you can get rid of more @available checks and other conditional code. Published July 28, 2016. Last updated August 03, 2016. Send feedback.